Conservative lawmakers and foreign policy activists also expect incoming Secretary of State Mike Pompeo and National Security Adviser John Bolton to heavily scrutinize and likely end the taxpayer-funded support for Soros's projects. The battle for the information became a flashpoint last fall in the fight between the State Department and Senate Republicans over outgoing Secretary of State Rex Tillerson's support for Joseph Macmanus, a 30-year veteran career foreign service officer, to become ambassador to Colombia. President Donald Trump agreed to appoint Macmanus to the top diplomatic post in Colombia over the concerns of several White House officials and Republican members of Congress, according to Capitol Hill sources. Several Republican senators, including Mike Lee of Utah and Ted Cruz of Texas, blame Macmanus for rebuffing their attempts to persuade Tillerson to launch an investigation into the relationship between Soros's groups and the U.S. Agency for International Development, or USAID. Lee is now single-handedly blocking Macmanus's nomination over concerns about the Soros groups' funding and Macmanus's ties to former Secretary of State Hillary Clinton and the role he played in helping her handle the aftermath of the Benghazi attacks. Lee, Cruz, and four other senators last year sought information about how the State Department and USAID were using millions of taxpayer dollars to support the activity of Soros's groups and other left-of-center groups "to push a progressive agenda and invigorate the political left" in countries such as Albania, Macedonia, Romania, and Colombia, which they argued had no clear U.S. national security interest. The senators wrote Tillerson a letter in March 2017 expressing concern about several Soros-funded projects, including one in Colombia in which USAID funds support a Soros-owned media portal that has criticized Trump, capitalism in general, and "patriarchal society." Macmanus, in a written response to the senators, defended USAID's work without responding to the concerns about U.S. tax dollars supporting Soros's causes and their call for a State Department review into those decisions. "The Department of State's foreign assistance programs are rigorously designed, implemented, and monitored to ensure that they are based on core American values," Macmanus said in his letter to the senators last year, according to an op-ed in the New York Post. The senators viewed the response as a blow-off of their concerns and an indication that Tillerson was keeping Clinton- and Kerry-era officials in key decision-making positions. The senators, including James Inhofe of Oklahoma, Thom Tillis of North Carolina, David Perdue of Georgia, and Bill Cassidy of Louisiana, also expressed concern in their letter that State Department officials with the help of Soros's groups were trying to give left-leaning groups more sway in influencing Macedonia's coalition government. "We find these reports discouraging, and, if true, highly problematic," the senators wrote, noting that much of the concerning activity in Macedonia has been perpetuated through USAID funds awarded to implementing entities such as George Soros's Open Society Foundations. "Our foreign aid should only be used to promote a political agenda if it is in the security or economic interests of our country to do so, and even at that, we must be cautious and respectful in such an endeavor," they wrote. "We should be especially wary of promoting policies that remain controversial in our own country and have the potential to harm our relationship with the citizens of recipient countries." Judicial Watch early last year reported that the U.S. government "has quietly spent millions of taxpayer dollars to destabilize the elected, center-right government of Macedonia" and that President Barack Obama's ambassador to Macedonia "worked behind the scenes with Soros to funnel large sums of American dollars for the cause." The New York Times also reported that former Prime Minister of Macedonia Nikola Gruevski has called for a "de-Sorosization" of society last year after Trump's win encouraged right-of-center politicians in the country and throughout Eastern Europe. The senators said the problem is not limited to Macedonia but appears to follow "a pattern of alarming activity in the volatile region." They cited leaders in Albania who have made similar claims of "U.S. diplomats and Soros-backed organizations pushing for certain political outcomes in their country." "Time and time again, foreign leaders visiting Washington have expressed concerns to us about how taxpayer funds are being used counterproductively in their respective countries," they wrote. "The situations in Albania and Macedonia are timely examples of this, but we have heard similar concerns from Latin American and African nations as well." Judicial Watch said millions of USAID dollars have flowed into Soros-backed NGOs in Colombia to support a controversial peace deal with the Marxist narco-terrorist group FARC that allowed Colombia President Manuel Santos to consolidate power and eliminate separation of powers. The original peace deal proposal failed when voters narrowly rejected it in a plebiscite in the fall of 2016. Santos resurrected the peace deal with the help of the Obama administration's USAID and Soros-backed groups, the watchdog said. 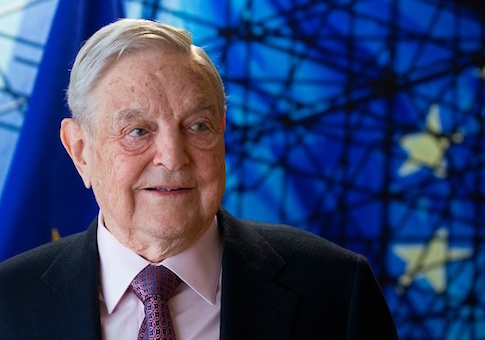 Judicial Watch said Soros's groups in Colombia have received millions of dollars from USAID, citing statement on the groups' websites and grant money listed on USAID's online database of projects. Conservatives argue that the Obama administration worked to unravel the force of Plan Colombia, a U.S. initiative that combined nearly $1 billion in U.S. aid with military and diplomatic support to fight against Colombian drug cartels and left-wing insurgent groups. Republicans supporters tout Plan Colombia as the country's key stabilizer over the last two decades, while many Democrats argue in favor of the peace deal, which they praise for stopping 50 years of conflict and bloodshed between the Colombian government and FARC terrorists and other rebel groups. This entry was posted in Issues and tagged George Soros, Judicial Watch. Bookmark the permalink.